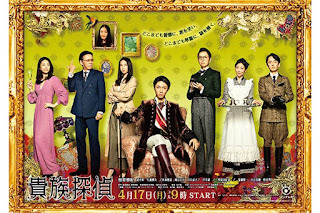 Cast: Aiba Masaki, Takei Emi, Namase Katsuhisa, Kinami Haruka and Okayama Amane. Takatou Aika (Takei Emi) is a young detective, working at her master Kitami Kirikos (Igawa Haruka) detective agency. She hasn’t had a breakthrough even though she spends most of her time focusing on cases and her work - she rarely gets a deduction right. Everything changes when she one-day encounters “The Noble Detective” (Aiba Masaki). Nothing is known about his except that he identifies himself as such, and that he is an aristocrat with a lot of money. All his deductions and investigations are carried out by his staff, and he spends most of his time entertaining young women involved in the cases. When I watched the first episode I wasn’t hooked at all, then when I continued I found the first drama ever that I couldn’t guess the ending off till the very last episode. That not only made me intrigued, but also looking forward to every week to see if the things I had guessed were right. All in all, a weird yet good drama, with good acting, and they managed to ‘fool’ me, so a “well done detective drama”.